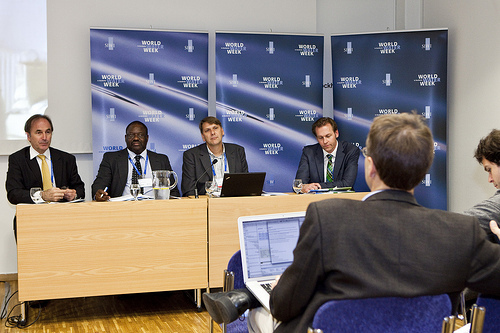 Professor Mike Young, Executive Director of the Environment Institute, recently spoke at the World Water Week conference in Stockholm. A green economy is essentially an economy that really invests in looking after the environment by putting money into the environment. The work is revealing. In fact, you can have faster economic growth and development. To hear Professor Young’s successful talk in full, click here. To view photos from the conference click here. Professor Young is also writing the chapter on water for a U.N. Environmental Program report on the green economy and blogged “How green should our economy be?” during World Water Week. To read his blog, click here. This entry was posted in News and tagged Mike Young, World Water Week. Bookmark the permalink.